‘Virtual City Playground’ Gets a Major Update on iPhone! Following the successful release of Virtual City Playground on iPad, G5 Entertainment has released a major update for the game on iPhone. Now in this update you can invite your friends to visit your dream city, ask them for help and share special gifts. When updating the game, you can build an Eco Skyscraper with your friends, make your city greener, decorate your landscape, build a premium tech station and set up a mass transit system and more. Virtual City Playground is a sim social that lets your imagination run wild so that you can look down at your wonderful metropolis and marvel at the wonders you’ve created. Please your inhabitants by providing them with tons of business opportunities and true-to-life neighborhoods and much more. Master trade, resources and balance between the booming development and the traffic that is a subsequent effect of the former. Socialize with friends — send gifts to them and get energy and invest points in return. Build an Eco Skyscraper and put your dream city on the map one floor at a time. Tackle new quests — over 35 new challenges to master. Beautify your city with new decorations and public art designed to uplift and inspire. Utilize a new, more efficient premium tech station and save room for more buildings. Play faster — recalculation optimization allows you to get back into your city in no time flat. ‘Virtual City Playground HD’ from G5 Entertainment Gets a Brand New Update! 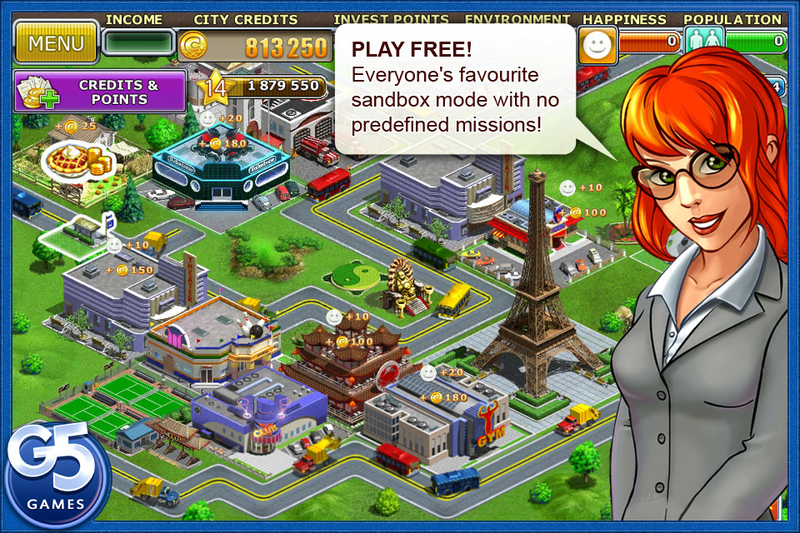 G5 Entertainment‘s leading game, Virtual City Playground, has been updated with new content, social features, improving changes and tweaks just recently. In the updated Virtual City Playground HD you can invite your friends to visit your dream city, ask them for help and share special gifts. Update the game and you can build an Eco Skyscraper with your friends, make your city greener, decorate your landscape, build a premium tech station, set up a mass transit system and a lot more. Virtual City Playground HD is a simulated social game that lets your imagination run wild so that you can look down at your wonderful metropolis and marvel at the wonders you’ve created. Please your inhabitants by providing them with tons of business opportunities and true-to-life neighborhoods and entertainment facilities, among other amenities. Master trade, resources and balance between the booming development and the traffic that is a subsequent effect of the former. Build an Eco Skyscraper and put your dream city on the map one floor at a time! Tackle new quests — over 35 new challenges to master – can you complete them all? Beautify your city with new decorations and public art designed to uplift and inspire! Play faster — recalculation optimizations allows you to get back into your city in no time flat! G5 Entertainment updates ‘Doomsday Preppers’, ‘The Secret Society’ and ‘Virtual City Playground’! G5 Entertainment is taking quality of gaming very seriously and as such they are taking time to update the user experience of their games. In particular, three of their games have been updated: Virtual City Playground, The Secret Society and Doomsday Preppers. You can see more details below. The game loads much faster. Zoom is improved. Find even more objects in the mysterious worlds you explore! Game stability and memory usage are improved. You can download The Secret Society – Hidden Mystery on the App Store by clicking here. Enjoy periodic visits from VIP Preppers, who bring along special bonuses! Game crashes are fixed. The game runs like clockwork now. Issues with malfunctioning bunkers are now fixed. Your preppers are now safe in their bunker! Bug with shelter floors not being populated by preppers has been fixed. Other minor improvements and optimizations. You can download Doomsday Preppers on the App Store by clicking here. See every single building in your city covered with a beautiful dusting of snow. Build a fabulous winter market and host a holiday bash to bring folks together! Spread seasonal cheer and goodwill with 25 awe-inspiring new building decorations. Help everyone relax and enjoy this special time of year with uplifting new quests. Await a surprise arrival, then light up the market in a dazzling fireworks display! ‘Virtual City Playground’ is Updated for the Holidays! G5 Entertainment‘s leading product, Virtual City Playground, received the update for the holiday season today. Version 1.9 is available as free download on iOS and Mac. Winter comes to your Virtual City Playground with snow, holiday decorations, fresh quests, a new entertainment building and a dedicated holiday event on plaza. Download the game update and cover the landscape with snow, run fun quests, build up a winter market, spruce up buildings and bridges with wreathes, celebrate holidays on Plaza and make your citizens happy. Virtual City Playground is a social game that lets your imagination run wild so that you can look down at your wonderful metropolis and marvel at the wonders you’ve created. Please your inhabitants by providing them with tons of business opportunities and true-to-life neighborhoods, and entertainment facilities, among other amenities. Master trade, resources and balance between the booming development and the traffic that is a subsequent effect of the former. Virtual City Playground is deep and ever evolving, yet easy to master. It is no wonder that Virtual City Playground has become one of the most beloved city-building simulators and ranks as a Top 10 Grossing Game in 100 countries, including UK, France, Germany, Italy, Spain, Japan, China, Russia, and many many more. And G5 continues to enhance the gaming experience by launching regular free updates to this hit city-builder, thus always giving gamers something new to dig into, solve and create. 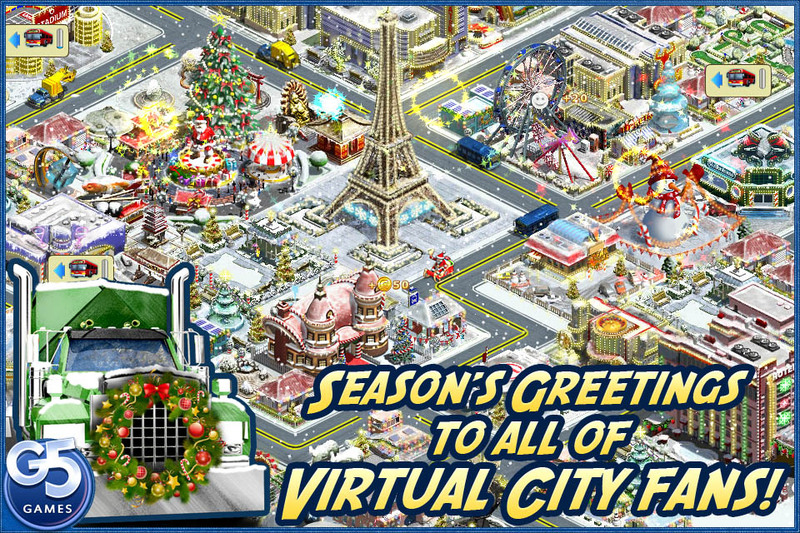 Season’s Greetings to all of our Virtual City fans! To help make your holidays even brighter, we have created a brand new content pack filled with merry adventures, festive gatherings and feel-good miracles. Get into the holiday spirit by decking the halls of your city like never before! One of the top casual games publisher for iOS, G5 Entertainment, has announced the upcoming game releases for the month of October. We won’t let you be bored this fall. Just check out the full load of fun, absorbing adventure and strategy games noted below! We know there’s something here just for you and for your platform. On that bright, sunny day, Rosemary accidentally drowned in the nearby lake and her friends couldn’t save her. Rosemary’s vengeful father makes a doll in Rosemary’s memory for her friends and their lives change forever! Two years have passed since your trip to the Cursed Valley. The pages of the Magician’s Handbook remain blank and life has resumed to its natural course, until the day a tiny fairy appears in your house pleading for help. A provincial Russian town has been shaken by grief: their prized, rare, striped elephant, Baldakhin, disappeared from the zoo in the dead of night. Two well-known detectives, the Pilot Brothers, set up a new investigation, pursuing the thief through 15 comic-style locations to find the missing elephant. Play as Brother Chief and Brother Colleague and solve tricky puzzles in this humorous adventure game for the whole family! If you love city building sims, you can’t pass this one by. You have a wonderful opportunity to take your real estate empire overseas. Travel through England, Spain and Switzerland while restoring rundown houses, beautifying neighborhoods with new landmarks and helping the locals improve their towns. Act wisely to get the job done on time with hurdles like weather conditions and crises trying to block your every move. Virtual City Playground will get a massive update, enhancing and expanding the game design and adding a number of new features that will make building your personal virtual empire the best city building experience the genre has to offer. The game feels almost completely new! You should try this social sim city builder now! The city’s mundane rhythm is suddenly disrupted by the emergence of a flying island high in the sky. Then one day, Mary, who works at the city orphanage goes missing after a beam of light is seen coming from the island above. Explore the creepy island using the clues Mary left, make friends with the spirits of the island’s people, solve challenging puzzles, find missing crystals and take your friend back home in this absorbing adventure. Travel though parallel worlds with Monica in search of her father, Professor Dumbdore, who mysteriously disappears after inventing the teleport! Investigate Robot World, River World, and the Flying City and track down Monica’s father in this exciting adventure game. Entries (RSS) | Comments (RSS) | 83 queries in 0.863 seconds.